The Motor City is your freeway on-ramp for all of Asia. Families flying to Asia from the eastern USA have only a few routing options that do not involve going to the West Coast first. Probably the most convenient and diverse set of choices for East-coast families who live anywhere but New York City involve flying through Detroit. Thanks to the auto industry’s global supply and sales relationships, and the good fortune of being a major hub for the old Northwest Airlines, DTW has long enjoyed excellent access to Japan, Korea, and China. Nonstops to Shanghai (Pudong), Beijing, Seoul (Incheon), Nagoya, and Tokyo (Narita). Flights inbound from Asia arrive early-to-mid-afternoon, allowing for same-day connections to about 90 eastern cities. The Mid-Atlantic, Northeast / New England, Ohio Valley, and Great Lakes regions are comprehensively covered out of Detroit. DTW is served by most of the other national carriers’ hub airports, although from a different terminal than where international arrivals dock. If you’re transferring to United, American, Southwest, or another carrier, you’ll need to take a shuttle bus and clear security again. As Asian trips through here will be on Delta, that’s where we focus this article. All flights from Asia arrive Delta’s McNamara Terminal in the central section of Concourse A. Getting off the aircraft, you’ll be directed below ground level and through a corridor to passport control - about a 5-minute walk. Expect lines at the passport desks of 10-20 minutes. Picking up bags and working through the declarations line (plus random screening) can take as little as 10 or as much as 60 minutes, depending on traffic and staffing. If you have a domestic connection, look for the Delta baggage re-check counter. Your bags will be x-rayed and sent on to your next flight. Exiting the customs zone will put you in the small reception area on the bottom floor of the McNamara Terminal. To get to your next Delta flight, head right to the elevators, ascend to level 2 and re-clear security. Budgeting two hours for international-to-domestic connections should give you plenty of cushion for delays and security. The “A” concourse at the McNamara Terminal is - literally - a mile long. The international gates are located in the center, where you emerge after security screening. To the left and right there are each about two dozen gates where the mainline jets dock, for services to bigger cities. Overhead you’ll see the red Express Tram, which connects the station in the center to both ends of the “A” concourse. From end to end the tram takes only 3 minutes. Extending down and forward from the center is a tunnel out to the “B” and “C” gates, which sit parallel to the “A” concourse. The B/C gates are used by regional aircraft to reach smaller cities and towns and to provide additional frequency to larger cities. Moving sidewalks are used throughout the gate areas, so while the complex is vast, getting to your aircraft does not have to take a long time. The Water Feature is a large granite reflecting pool and arrangement of computer-controlled water jets that propel streams in graceful arcs from point to point, much like aircraft tracing the lines on a route map. The arrangement lasts about 2 minutes, and there is plenty of seating around the fountain to relax and observe. The fountain itself is just outside the main flow of foot traffic, so your kids won’t be getting underfoot if they want to stand and watch for awhile. There is plenty of seating throughout the gate areas, and you can easily find an unused gate for quiet time. Concourse A is surprisingly quiet for all the activity, thanks to noise-absorbing ceiling panels. There is even a subtle breeze of fresh air flowing through. Have the kids listen carefully, as every few minutes a recording of a hawk’s call is played. The terminal is so large that small birds have made it their home, and the calls are intended to keep them on the move rather than setting up nests over travelers’ heads. The Light Tunnel is lined with etched glass panels that resemble clouds, mountains, ferns, and dragon scales, and multicolor LEDs which glow and change color in time with an original half-hour long musical composition. Walking back and forth through the tunnel to view the entire presentation - including an artistic impression of a thunderstorm - is a great time & energy drain. Near gates A18, B21, and C4 there are small play areas. These are modest - no slides or climbing equipment - and shoehorned next to gate seating. The McNamara Terminal features 16 immaculate family restrooms. These are generously sized with a large private stall, fold-out changing table, electric sockets, and a chair. Standard restrooms also include built-in changing tables, and are regularly cleaned. Stall space is about average - a tight fit to try to manage a suitcase and a child. There are no shelves to keep your bags off the floor. DTW is a great airport for food choices. There are food courts at either end of the A concourse, and additional restaurants and stalls spread throughout A, B, and C. The usual fast-food chains are represented, as well as sit-down restaurants and specialty stands featuring regional and world cuisine. This article from Eater gives a full listing and recommendations of all the food options in both the McNamara and North Terminals. Most of the shopping options at DTW are of the newsstand and travel-accessory variety, with a few high-end jewelry/luggage stores. There is an outlet of the Henry Ford Museum near the central tram stop, and a branch of the KidZoo chain just north of the same stop, which will have something to appeal to the kids. WiFi is available and complimentary for the first 30 minutes. There is no rail service from the airport; public transportation from the McNamara Terminal includes SMART bus route #125 to the Southland Shopping Center in Southgate, and a new bus rapid-transit service to Downtown called the FAST Michigan Line, which takes about 1 hour and connects to two other rapid-bus lines, plus the downtown people mover and Q-Line at the Cobo Convention Center. If your inbound or outbound connection requires an overnight stay, or if you are driving in and would like to have a night to relax before or after your trip, there are many family-friendly hotels close to DTW. 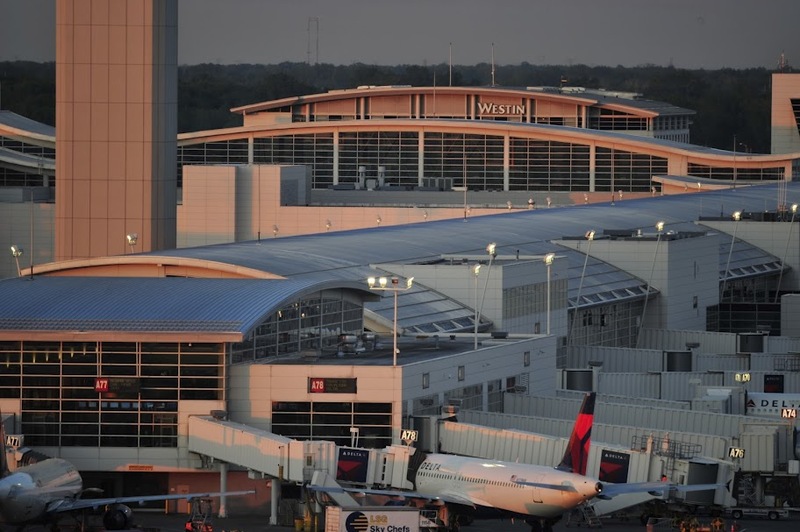 The most obvious property is the Westin Hotel actually connected to the McNamara Terminal and has its own TSA checkpoint from and to the main concourse.